Learn how Tai Chi is more than just another form of martial arts. If you were drawn to our Peia Pathways website based on the emphasis of the “Zen” lifestyle, you may also be wondering what other elements of Chinese culture are pertinent to this site. And in response to that I have decided to write an article on the ancient martial art of Tai Chi. Like our other article on yoga, Tai Chi improves all facets of yourself, which makes it a very appealing activity to undertake, assuming you have the right mindset for it. Before we go any further though, I feel it is important to note that even if you have no experience with Tai Chi, or simply no experience with martial arts in general, Tai Chi can still be a valid activity for you. Despite requiring a lot of skill and effort to truly master, there is a relatively easy learning curve when you are just starting out, and the benefits are still quite noticeable even for such beginners. Tai Chi, as I mentioned earlier, is a form of martial arts. What makes Tai Chi unique from other forms of martial arts is the generation of life energy, also known as “qi” that (ideally) flows effortlessly throughout your body. If you are able to master Tai Chi, you are able to feel this inner life energy within you and convert it to a powerful, yet controlled, force. In terms of the stylistic elements of Tai Chi, the movements that are involved are much more fluid, almost as though you were transferring energy throughout your body like a flowing river. But your movements still convey a sense of ferocity, making Tai Chi a very unique form of martial arts that combines beauty and power, two seemingly incompatible elements. For casual learners of Tai Chi (which would probably be most of you reading this), the art itself is not as intense as for those actually practice Tai Chi for a living, or who have studied it for many years, many of whom have mastered it. In reality, it is probably just at step up from yoga in terms of how taxing it is on your mind and body. Instead of still poses, Tai Chi involves subtle movements, and require full body-coordination to do them. 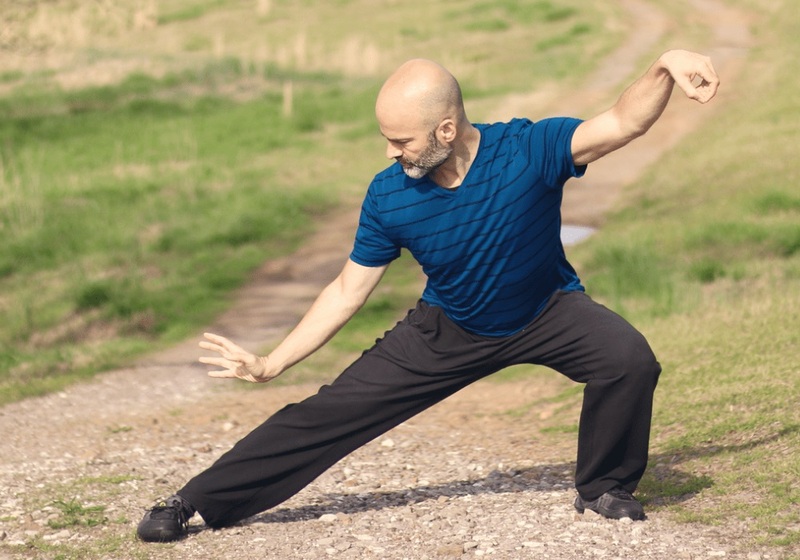 Similar to yoga, practicing Tai Chi can help improve your overall strength and flexibility, although it probably will improve it much more significantly than yoga. And while Tai Chi and Yoga are fairly similar, another major difference is the emphasis of meditation that comes with Tai Chi compared to yoga. Yes, yoga does implicitly involve forms of meditation such as focusing on your breathing, but Tai Chi really takes it to another level. This is mainly because Tai Chi places a great emphasis on making your mind and body work as one entity. Movements are fully synced with breathing, and your mind needs to constantly focus on the inner energy within you and transferring that energy out of your body. Luckily, although (or should I say because) Tai Chi is more mentally and physically taxing on you than Yoga is, the benefits of practicing it on a consistent basis are greater. Your strength and flexibility will improve fairly rapidly by practicing Tai Chi, and from a mental point of view, you will very quickly learn to tap into your inner self and control and your emotions and deal with internal struggle. The overall level of fitness required also actually works up a sweat (compared to Yoga which barely does so), meaning that you are getting a legitimate cardio workout as well. And last but not least, Tai Chi is great at helping you improve your balance – even more so than Yoga because you are constantly transferring your body weight in Tai Chi movements, compared to the static movements of Yoga. If you take anything away from Tai Chi, know that it is a complex and often misunderstood art form, in part because there is so much emphasis on syncing your mind and your body with each and every movement. It takes a lot of concentration and effort, even more so than yoga, but the potential rewards are greater to account for the added complexity. So if this powerful yet beautiful art form interests you at all, I highly encourage you to seek out Tai Chi lessons wherever you are located, to start learning it for yourself.